Reminiscent of an ancient castle majestically presiding over the countryside, the Dream Hotel Gran Castillo & SPA Vitanova in Playa Blanca, the most prestigious area in the South of Lanzarote, offers unbeatable views onto the Atlantic Ocean and neighbouring islands. This ocean-side luxury resort in a contemporary Moorish-style complex is 2 km from Rubicon Marina and 7 km from Pechiguera Lighthouse. The Hotel Pincesa Yaiza is located at the very side of the fishing village of Playa Blanca on Playa Dorada. 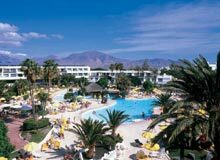 Hotel THB Tropical Island is a spectacular resort located in Playa Blanca, Lanzarote. Designed especially for families and groups of friends, it has everything you need so you can enjoy an unforgettable holiday within resort itself and just steps away from your apartment. 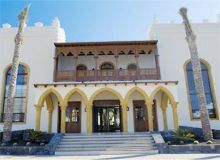 The Elba Lanzarote Royal Village Resort, located on the magical island of Lanzarote, a Bioshphere Reserve, is a complete holiday complex inspired by the culture of the Canary Islands, reflected in its architecture of a typical Lanzarote town. The H10 Lanzarote Princess is located on the southern coast of Lanzarote, in the fishing village of Playa Blanca, close to the sea and opposite Fuerteventura Island.